There’s been plenty of digital ink already spilled about Green Book being a White Savior Film. While I’ll also spill a bit of my own on the topic, there isn’t much I can add. For me – an average white dude who’s seen his fair share of movies – the most glaring fault about the picture, a dramedy dealing with race relations in the Jim Crow era, is the paint-by-numbers feeling of it all. This is a movie that strives to hit every standard beat in the uplifting “inspired by a true story” template. As an exercise in mediocrity that serves up something we’ve all seen dozens of times before, Green Book is an unparalleled success. It’s utterly predicable and is the kind of movie that would have felt fresh had it been made 20 or 30 years ago. Still, for all it’s flaws, Green Book isn’t entirely without its charms. In addition to a superb turn from actor Mahershala Ali, the movie does provide some inspiring moments and a message about race that plenty of people still haven’t absorbed. Green Book is set in the early 1960s, and it tells the story of an unlikely friendship. Don Shirley is a classically trained pianist and musician who holds several doctorates in his field. He has gained acclaim as a jazz artist, and his record label is sending him on a tour. The tour will start in Shirley’s home town of New York City, but the bulk of performances are scheduled in the deep south. As a black man, Shirley wants a driver who can also serve as a bodyguard, should he need protection. Enter Frank “Tony Lip” Vallelonga. Tony is a bouncer at a nightclub, and when it closes for renovations, he starts looking for other work. The Italian-American has connections that can get him a job in “sanitation,” but before he resigns himself to working as a paid goon, Tony gets an interview with Shirley. The two don’t exactly hit it off, but Shirley sees that Tony has the skills he requires, so he offers him the job, and they embark on the eight-week tour together. Green Book has gotten quite a bit of flack from Don Shirley’s own surviving family about its egregious lack of accuracy. They have called the film “a symphony of lies,” and Mahershala Ali even went as far as to contact them to offer his apology for how it portrayed Shirley. Filmmaking is an art form, and movies based on real events deserve the benefit of the doubt when it comes to artistic license. Changes that screenwriters make in the service of crafting a compelling and engaging story, if made responsibly, are forgivable. It’s part of the process. The problem with Green Book is that it’s neither compelling nor engaging. Tony Vallelonga’s son, Nick, wrote the screenplay, with help from Brian Hayes Currie and the film’s director, Peter Farrelly. The movie’s core themes of racism – the title refers to the guide book that helped black travelers find hotels and restaurants willing to serve them in the Jim Crow Deep South – and people coming together despite their differences are examined from the wrong perspective. Green Book is a movie about black people made for, and largely by, white people. This would have been a novel approach two or three decades ago. It fits right in with a film like Driving Miss Daisy or Dangerous Minds, where people of color exist in the movie only as a way for the white hero to learn and grow. That technique simply doesn’t cut it anymore. That’s especially evident when you consider Green Book alongside another movie made in 2018, the phenomenal If Beale Street Could Talk. That’s a movie about the black experience told from a black perspective, no central white hero necessary. Beale Street has also garnered a fraction of the attention that Green Book has, which is both telling and sad. What’s also sad is the fact that we obviously still need movies like Green Book. While Beale Street tackles advanced ideas like racism being a systemic problem, there are millions of people who haven’t learned the lessons Green Book is exploring. This country elected Donald Trump, after all. So while the movie sets up an easy, convenient (read: lazy) version of racism, it might also do the job of actually reaching people. Early in the film, Tony’s wife, Dolores, gives two black men who the Vallelonga’s have hired to replace their kitchen floor tile each a glass of water. Tony sees this and, after the men leave, he throws the glasses in the trash. Dolores finds the glasses and pulls them out, with a disapproving scowl on her face. That’s the level of subtlety on which most of the movie is operating. Judging by the fact that it won a Golden Globe Best Picture award, though, it’s clear white America isn’t ready to handle more nuanced discussions about racism yet. 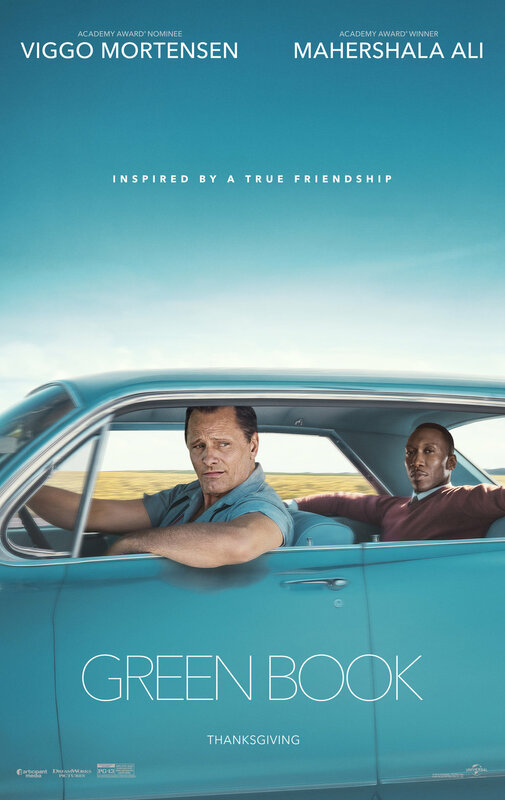 Where Green Book works best is in the chemistry between the two leads. Mahershala Ali as Dr. Don Shirley and Viggo Mortensen as Tony Lip have a rapport that sells both the lighter moments of comedy and the more intense bits of drama the two men share. Mortensen, to the detriment of his performance, is in perfect sync with the movie. His thick Italian-American New York accent and tough-guy mannerisms mean Tony Lip might as well be named Fat Tony, the over-the-top mobster caricature from the television show The Simpsons. Every moment Mahershala Ali spends in front of a piano during the movie had me stunned. The actor looks completely natural, so much so that I did research to learn if he knew how to play the piano before taking on the role. He did not. Three months of intense lessons with Kris Bowers, the film’s composer and stand in for Ali when the movie cuts to just the character’s hands, is what made the actor so convincing. Ali’s performance, which builds to a crescendo during a scene in which Shirley expresses outrage to Tony for not having a community to call his own, is the best thing about the movie. Shirley isn’t culturally black enough for the black community to accept him, and he’s the wrong color for white people. Ali beautifully transmits the anger and frustration of this reality. There is also one brief moment in Green Book that deals with Shirley’s sexuality. While the actor does a fine job giving subtle shadings to this aspect of the character throughout his performance, the movie glosses over it in short order. Green Book hits every last note you would expect. While there are a few gems, like Ali’s performance and his and Mortensen’s chemistry, the movie never transcends its clichéd trappings. Its white-savior point of view is a device that should be retired once and for all. - Technically, Green Book is standard, cookie cutter movie making. You can see every plot development coming before it ever arrives. Thematically, it’s a movie about black people made for and by white people; it has a bad case of white savior syndrome. The only real stand out thing about it is Mahershala Ali’s performance. - There isn’t even really anything about Green Book aesthetically that sets it apart. The cinematography isn’t cinematic; it’s on par with something like Mad Men. That’s a great series, but it’s not the magic of the movies. The direction by Peter Farrelly is workmanlike. It’s something dozens of other filmmakers could have done. - Early in the film, as Tony is driving Don Shirley to his first tour stop, Tony turns on the radio. Little Richard is playing. Shirley makes a comment that he’s never heard it before because he doesn’t listen to rock and roll music. Tony is incensed. My immediate thought was that by the end of the movie, we would get a scene of Shirley playing rock and roll as an uplifting scene towards the end. I’ll wager you would feel comfortable betting your life savings on if I was right. - To the movie’s credit, it doesn’t use montages as a crutch, which a movie like this easily could have done. - Wrapping up my awards consideration watching, so this one was on a screener DVD at home. I’m assuming Green Book will be nominated for a Best Picture Oscar. That won’t upset me as much as Three Billboards Outside Ebbing, Missouri getting a Best Picture nod last year, but Green Book is not a Best Picture nominee caliber film. - When M. Night Shyamalan released his break-out hit The Sixth Sense twenty years ago, he became a box-office and critical darling. His career since then (especially as far as critics are concerned) has been…rocky at best. Shyamalan is back with the third installment in his super hero story line that kicked off with Unbreakable in 2000, followed by 2016’s Split. Glass stars Samuel L. Jackson as the eponymous villain, along with Bruce Willis and James McAvoy.